A federal bill to label GMO foods garnered protests not only from Vermont senators Bernie Sanders and Patrick Leahy, but also members of the group Organic Consumers. They threw $2,000 in bills down to the Senate floor during a vote. 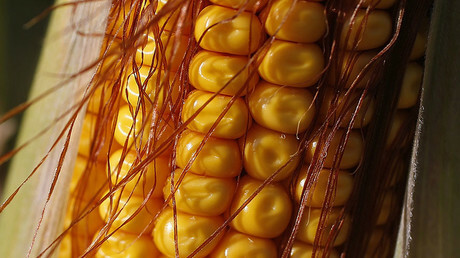 The federal bill would undermine efforts by states around the US to label foods containing genetically modified organisms (GMOs). Vermont’s law went into effect on Friday, and was the first state in the country to mandate labeling for GMOs. Due to the law taking effect, food manufacturers such as Campbell’s, Frito-Lay, Kellogg and ConAgra announced they are already labeling their products nationwide. The federal bill, often referred to as the DARK Act or Denying Americans the Right to Know Act, would create a national standard for labeling genetically modified food. Critics say it is confusing, because it allows companies to label using text, symbols or an electronic quick response code (QR code). The bill also lacks federal penalties for violating the labeling law. Senator Patrick Leahy (D-Vermont) released a list of amendments to the DARK Act at the press conference. The bill’s sponsors are expected to block any effort to amend the bill. Among the amendments were striking provisions to preempt seed labeling laws, to strengthen the definition of bioengineering to encompass highly processed foods, to require the code to say “GE information” rather than “food information,” and to grandfather in Vermont’s law and other similar labeling laws enacted by 2016. 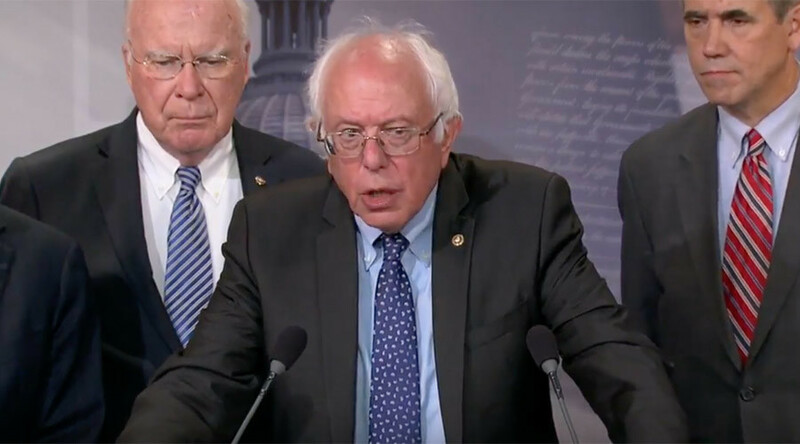 Joining Leahy and Sanders at the press conference were Senators Jeff Merkley (D-Oregon), John Tester (D-Montana) and Richard Blumenthal (D-Connecticut). In a separate demonstration on Wednesday afternoon, members of the Organic Consumers Association threw money from the Senate gallery onto the floor to protest a procedural vote to advance the bill in the Senate. Protesters yelled, “Monsanto Money” and urged Senator Debbie Stabenow (D-Michigan) to “listen to the people, not Monsanto,” while $2,000 in cash floated to the floor. Stabenow was one of the lead sponsors of the federal bill. One senate protester tackled in the hallway, lead away in handcuffs. Still shouting about GMOs. Protesters said the money was to symbolize the money senators received from Monsanto and other agribusinesses. The Environmental Working Group calculated that food and biotech companies and trade associations have spent nearly $200 million to oppose state GMO labeling ballot initiatives such as Vermont's.